Like a hug. Wilfred's much-loved mock neck sweater is knit with a lightweight but extra-fine merino wool from Italy. It has drop shoulders and a slouchy silhouette. I like this sweater as the color and the size are exactly what I expected. I especially like the material which is very soft and comfy. I bought the marine green colour and I LOVE it. It's so different than anything else I own & I get compliments on it everywhere I go. That being said, the sweater could be a tad longer so it covers the bum. It’s a beautiful style and material. Not itchy and will wear well with time. Really good investment. This the third montpellier sweater I bought. The first two have started to pill after many wears. Hope this made in Italy one has better quality. That being said, I love the style and color (pegan). It pairs great with skinny jeans and winter coats. I love this sweater! I also have the dress version so I picked this one up in the pagan colour and it will definitely be another everyday go-to. The material is nice against the skin, not itchy. It is a bit oversized already but I always size up for that extra casual oversized look. I pair it with jeans, [faux] leather tights; easily dressed up for the office or dinner and down for everyday/chill. Such a great sweater, fits a bit big so I would go down a size. So comfortable but great for work too! Overall.I’m very pleased with the design and colour, might prefer finer weave wool though. Getting lots of compliments on the style. Loose neckline but a bit higher looks great. I ordered one in brown, size S. It is very comfy, warm and not itchy! LJust loved it!! Ended up ordering greenish in size M. Both feel and look fantastic! You can dress them up or down. Highly recommend and would buy more colors. I think I like size S more, I am mostly size S in Wilfred. It's so cozy and chic! It had become my favourite sweater! On the days when I just want to be comfy but still look put together I pull out this sweater and pair with the Aritzia black Daria pant and black boots. 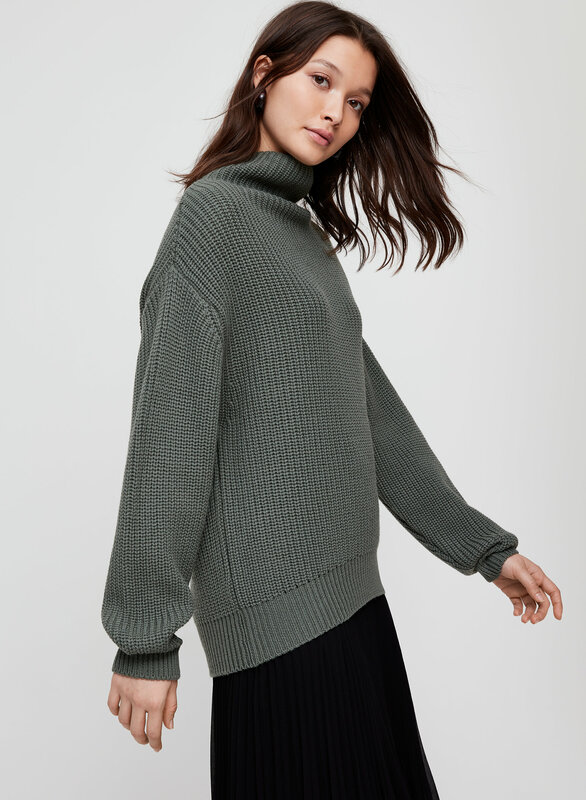 I have this sweater in M and S in multiple colours but like the fit of the small better, traditionally im more of a medium fit. 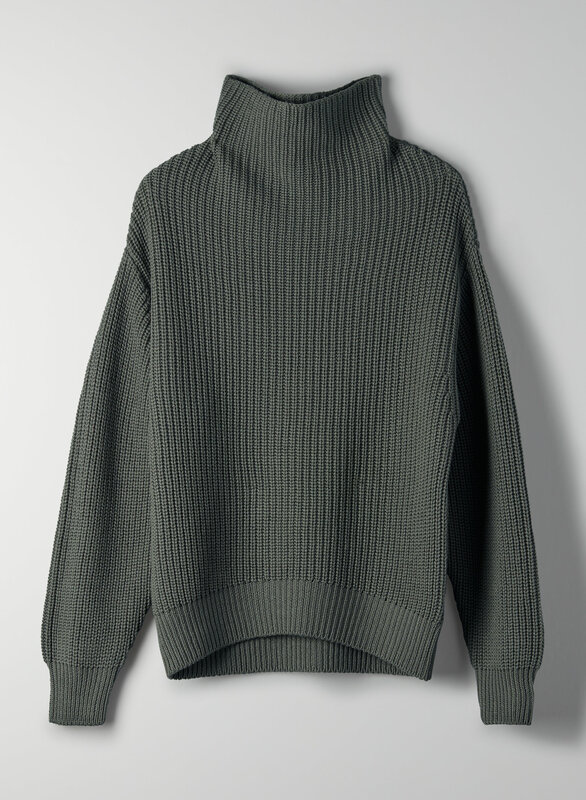 This sweater is also not itchy at all and keeps you warm in these bitterly cold winter months. Love the sweater and the fit! The collar is a bit odd... still figuring out how it should lay. Feels good to have some color in my wardrobe vs neutrals all the time. I debated for awhile if I should buy this sweater and I’m so glad I did!The fit is nice and sleeve length is just right. I love the Hyacinth color and have had so many compliments. Definite wardrobe staple. I love the color and style. Also it was perfect size for me. perfect length with oversize fit! perfect length with oversize fit. make you leg looks super long. 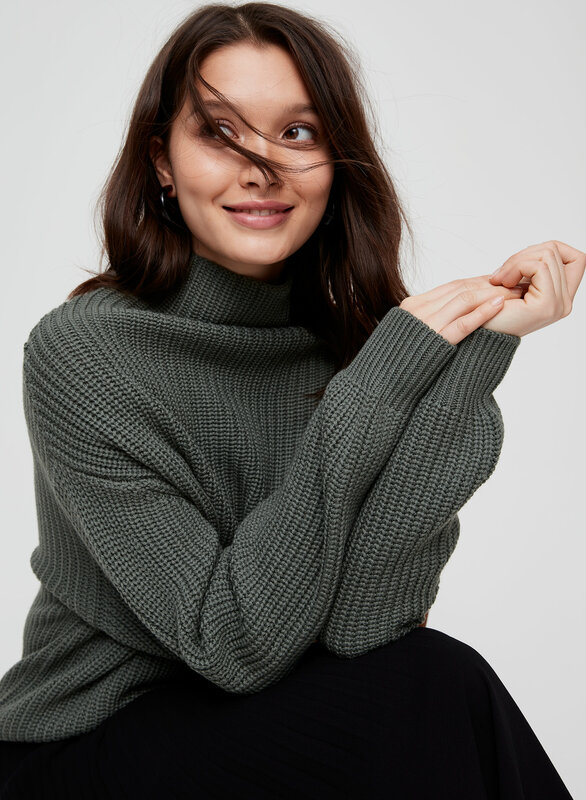 The turtle neck is not only stylish but also warm. Great wool quality, love! This is the cutest sweater I own! it was the best gift as its super comfortable, warm, and flattering! I got it in heather birch and its absolutely adorable. Love this sweater! I have it in heather birch and it is so beautiful! I have sensitive skin, and the wool does not bother me at all, it also doesn't pill that much which is very nice! One thing to keep in mind is if you want that oversized fit, to size up a size or two. Mine has shrunk slightly from washing. This is my third time buying this sweater (can you tell that I love it?) Everytime winter rolls around, I'd always hope they'd bring this sweater back in new colours for the year. It's literally the best sweater that can be styled in different ways. I've always taken a size XS as that's my standard in Aritzia and it fits perfectly. Definitely recommend this to anyone who's thinking about it or who's been looking for the perfect comfy, slightly slouchy but, warm sweater. It never makes you itchy. Just be mindful of the care instructions as this will shrink and the knitted texture will get matted if not taken care of properly. Trust me to know this as I've messed up a few times. Love this sweater. I had a colour from 2014 in my closet already but wanted to add another one :) I'm usually a size S or M depending on the fit or brand. I got a medium but could probably have gotten a small. The oversized fit of the Montpellier is super flattering. Be careful about washing though, I’ve had some issues with the quality (shrunken warped fit and the wool feels different) after my first wash on most of my sweaters from Aritzia. From experience DO NOT wash unless you have to - go to dry cleaners. Such a great sweater! I am very happy with this purchase. Despite being pretty expensive it seems worth it. I got the Birch colour and love it! Goes with everything. Amazing sweater, best purchase I’ve ever made! The wool is super soft and not itchy. It fits perfect and it amazing for the cold Canadian days and nights! I love this sweater so much! Just what I expected...very good buy! 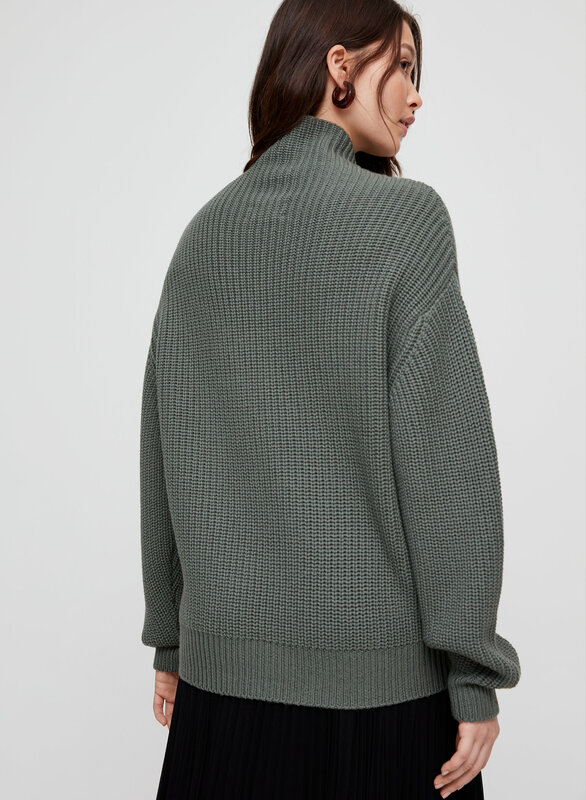 Unexpectedly soft and well fitting for a chunky sweater. Usually large knits drown me out but this one fits just right and has great structure and form. Love it! Year after year this sweater never disapoints, super soft and warm and such great quality. Fits really oversized, so size down for a slightly more fitted look. Cozy, relaxed fit. Super comfy and warm. Good quality material. I bought one of these last year and loved it so much that I bought another this year. I want it in every colour (but it's a bit pricey). The sweater is very soft and warm, I can walk outside in -5 degrees weather and be okay. It fits slightly oversized, but I like it that way. This sweater is simply beautiful I love that I can wear it at work with a pencil skirt or with jeans with a more relaxed look. One of the most beautiful sweaters that I own. Excellent purchase, very warm and great fit. Color is a striking purple and I get lots of compliments on the color. Fit is snug and fits a bit on the cropped side. I went up a size because I liked the more loose fit when it came to this sweater. It was more cozy and comfortable. The small fit true to size but the medium was what I fell in love with. I had the same sweater is black and I shrunk it, which I was sooo upset about. I loved the sweater so much I had to buy it in a different colour. 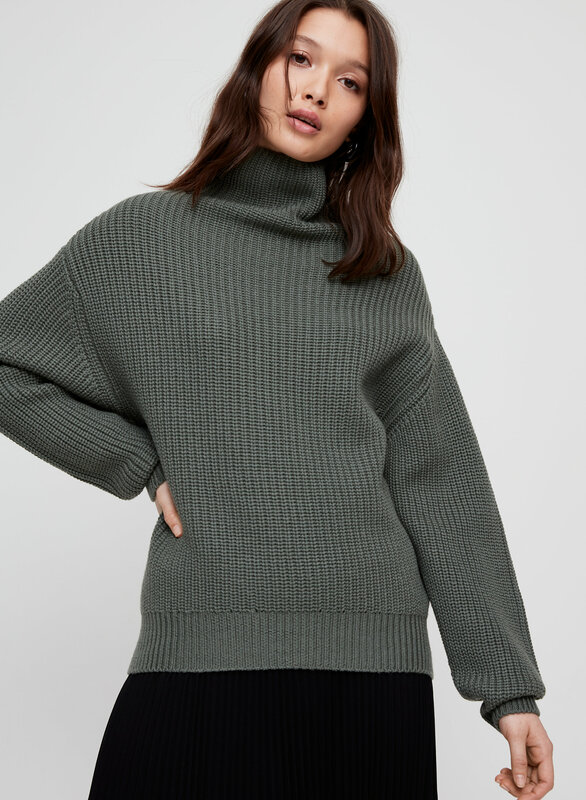 100% would recommend to anyone looking for a perfect turtle neck. - I gave it 3 stars as it does not wash well and has started to pill after on 4 wears. The Montpellier sweater is by far the comfiest sweater I own. Although it is wool it is 100% not itchy and very flattering despite being oversized. 10/10 would buy again. So cute and I love the purple color. It is a little itchy but with a t-shirt underneath, it is fine! Comfy and oversized, just the way I like it!